Notes: Translation by Karis McLaughlin. Please note that ‘…’ denotes that the recording at this point was indecipherable. Alfredo López (AL): This radio station was burnt down on the 6th January  and the campaign was launched. Dominic and his organisation [ENCA] took part in the campaign, and on the 6th February we re-launched the radio station on air. This booth was burned, number two, booth number one as well, where we are broadcasting from now. People came from the United States, Canada, England. We worked for three weeks. We launched a new radio network, of Mesoamerica, with participation from Guatemala and Honduras. It was in this community, Triunfo de la Cruz. Also, for the first time Radio La Voz participated from Zacate Grande, which is an island where there is now a radio … in the south, right next to El Salvador. That is where the problem is with a man named Miguel Facussé, a problem that we also have here … He wants to destroy the radio, but we are fighting together. We are very poor, so we have to unite to fight together. This is specifically the case … there is something very important that we are doing now … in Honduras to be able to make a proposal … for community radio. It is not to change the law, but so that the law has a … because the Honduran radio spectrum is owned and belongs to the oligarchy – Facussé, Ferrari, Callejas – but now we want to democratise … that is the work that we are doing as pioneers of alternative communication … was the first. Sure, there are other local radio stations … but they are of a social-commercial nature, we are … we have been on air for more than 15 years, so that … a lot of work. But now, as we are part of the National Front of Resistance, we have convinced them, because they too have realised that communication is power, so they are willing to work with us. 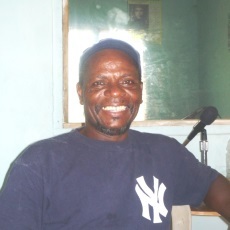 We are in the cities, the slums, we are doing … because they also want their community radio stations. Until now we had a lot of radios stations in the rural areas, but now there is a big demand in urban zones, the areas … and now we are arriving, we are nationalising the idea and it is taking some force. Martin Mowforth (MM): Radio Globo was closed? AL: Yes. Radio Globo continued broadcasting only on the internet and we can get the signal here. We downloaded it here and put it on air. MM: Can you explain the case of the fishermen? AL: The Cayos Cochinos Foundation has done a sort of zoning of the Cochinos Keys, in some areas artisanal fishing is allowed and not in others. The problem is that the fishermen live from fishing and they use artisanal equipment, they do not use GPS, or technology, sometimes they use oars, sometimes they fish with some small sailfish. So they do not know where you can and cannot fish, and since there are no signs they often fish where they believe the fish are. So the Foundation seizes them and confiscates everything, takes some of them prisoners. There is a type of fishing that we call los chorros, five or six people go and when there are signs of fish they put out the net, they round up the catch and pull it to shore. That fishing … and that is something very important for us communities because when they catch fish, nearly the whole population arrives. They call them chinchorreros, because they use a big net, they are people from the community, the Garifuna. They have to go out quite a way, because the net is quite large. They cannot do this job anymore, it is prohibited. Apart from this they were doing some reality shows, Italian film companies were coming to make films here. There is big money involved. But what is happening with this? Why do they take certain areas of the Cochinos Keys? And when they are filming no one can pass through there. If you have to go fishing you cannot pass through the middle of the keys, you have to go around, some 15 kilometres, to go fishing, and if a fisherman works with the oar, he does not have a motor or anything, and if they are filming for 15 days, no one can pass. We condemn that, and I personally went to do an inspection because there had been lots of complaints from the fishermen because they could not go out. The military is looking after … at the request of … that park authority, also our Garifuna organisation. So those from the Foundation said that I could do an inspection, but the Italian would not allow it … so he told me that I should come back another day, but I did not come back because we do not have the time to be going. … to Italy, and they responded that many people were granted work … that the reality show had improved the living status of the fishermen. They have been deceiving the people … the fishermen have not been consulted, they have not been told how they are going to be able to fish and how they are not going to be able to fish. Only line fishing is allowed. We are working. There is a boy with two bullets in his hand … in one of the operations. That is one of the cases which we are going to present in front of the Commission. The boy has practically lost the use of his hand. There are other fishermen, including one of my brothers, who were going fishing, they took the boat … and they left them adrift, swimming, they were helped by other fishermen. We are preparing the video, it is going to come out, because we are sending it to the Commission, with the testimonies of those affected. It was terrible. Without doubt, we are hoping to win this case, the case of El Triunfo too. We hope to win them all. Already we have put forward a case, the case of Alfredo López against the State of Honduras, because I was in jail for six years and six months, charged with a crime that I never committed and not even now do I know if there was … Right now we are in compliance with the … we are in that now, the State is talking. That is the case that has driven the other cases, especially El Triunfo de la Cruz. The State never fulfils everything with the sentences, but at least they made an attempt because otherwise no one controls them. We know that the United Nations is of the same States, but … independent of the OAS. In addition, the sentences … and the case law (jurisprudencia) is important. There was also a programme here that was called the Land Administration Programme of Honduras (Programa de Administración de Tierras de Honduras, PATH), for land titling, and this programme was for … throughout Honduras, even us, the Garifuna communities, but in accordance with their vision, of the State, for doing business, that is, that they were going to privatise here. We had to sue the World Bank because they were providing the funds … and the inspection panel of the World Bank … we were right. So now PATH cannot be done in the Garifuna communities, and therefore all the properties that have been the subject of negotiation by the banks … that is why the recoveries which I was speaking about at the beginning … it is common land and it cannot be seized. MM: This proposal is from the Government? AL: Yes, and the Bank was … the banks, also the World Bank and the IDB. MM: … by environmentalist groups about the Cochinos Keys Foundation … this conflict, they have … what is your relationship with Fundación Prolansate? AL: No, there is a lot of conflict and that relationship, especially here … has a lot of history. Why? Because Fundación Prolansate says one thing in statements and in reality does something else and so we’re not very enamoured of them. Before that, in 2003 … another case. That is why the relations are not good. One of Prolansate’s boats … passed by and there were children … went by at full speed, it took out these children and one of them died. We appealed for the case. What did they do? They won over the mother … balls to us because we were considering a lawsuit. Then the lady … they gave 10,000 lempiras to the boy’s mother and that put a stop to the lawsuit, because they said that they had made a settlement … we had to forget the case, but that was a precedent for us … the environment and the people, of course. They did that here, about three months ago … they came here, I do not know what they were doing, inspecting, and they seized … Then the fishermen, as they do not know where to turn, came here, to the radio, it was full … we, they cannot come to confiscate nets without saying what is happening or what they are going to do … what they are doing at least. They came and seized the nets. The people were agitated. So here we made several reports, we spoke to the fishermen … were listening to the authorities. A meeting was called … Natural Resources and Prolansate, who were involved in the seizures, and the fishermen, and we were there to help guide … What was the meeting for? To explain to the people that what they were trying to do was explain the size of the nets which would be allowed, but that they were not seizing. MM: They are asking what are the rights of … the fishermen, what they can and cannot do. AL: There is a decree that gives them the right, supposedly for protecting the area, but not for harassing the people, they confuse the situation, because they wanted to explain that you cannot fish with some nets … that also we use traditionally. But I say to them, ‘but if we have used it for so many years, for so much time, why do you now come and tell us which is the right size of net?’ Furthermore, they should come first and then make the seizure … but you come and do things first and then come to explain it. Because the point is that there is a decree … so as there is a decree for the Anercagua Park (Anconcagua? ), it is a legal matter, but … to prevent abuses, but they do not count … so the lawsuits. They did not consult us … we are going to do such thing, they do it, and OFRANEH like it does not exist. That is why the government itself is in trouble with these projects because we have seen that with these projects, you cannot, we do not agree, but they do it. But they need us to tell them that … from the organisation. The decree says that you have to consult the organisation representing the Garífuna and officially we are one of them. … they are doing to counteract this, as a government strategy … that is supposedly participation of the Garífuna people, but the council (patronatos) is not handling it … it is uncomfortable negotiating with you, they get hold of something else … you are going to represent … but it is not that really they are doing it in the right way. … one or two projects of the IDB or the World Bank, so they sponsor them. This is how things are, which is why there are communities that we are not going to be able to save, some will be lost … show them some of the things that … we can go there to the land and we can take a look, right now. AL: FUCSA, the last one which was terrible, there was a team of fishermen from here in Triunfo, fishing in Cuero y Salado [Protected Area]. They fired on the fishermen at night and killed one of them. MM: FUCSA is an environmental organisation, like Prolansate. MM: The other thing that Alfredo was saying a little while back was that, given the relationships with the environmental organisations like Prolansate and FUCSA, they believe that they have to work with nature and natural resources all the time and it is they who have to look after them.